Okay, technically not a movie…although I’ve included TV episodes on my lists before. But this is the only standalone episode of any show to make it on this list…true there were some very funny episodes of the other Star Treks, some great moments of X-file humor, and I am still looking forward every year to The Closer’s Flynn and Provenza episode. But while almost every show has a great moment in comedy, I think only the “Trouble with Tribbles” really rises to the bar of the Top 30 comedies (if I did a top 40 there might have been an X-file episode or two, “Bad Blood” & “Jose Chung’s”, but I figured 30 was pushing it as it was. Tribbles are possibly the cutest prop ever developed. A purring ball of fur. How can you not love a purring ball of fur? 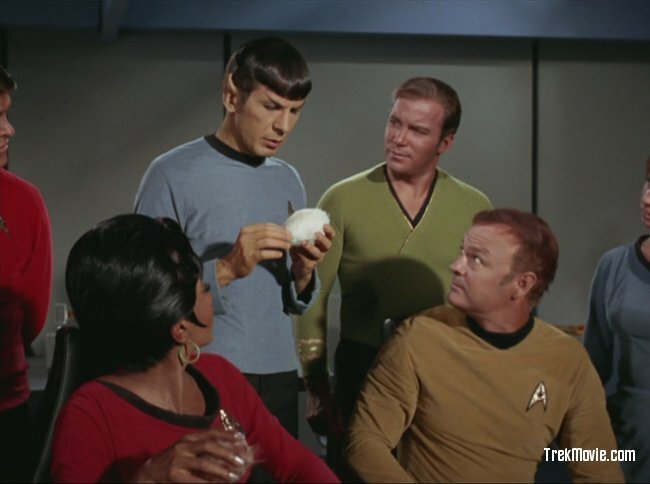 But it’s not just the tribbles that make the episode. I will be the first to admit there were some pretty low moments in the original Star Trek. Episodes of bad writing, bad directing, bad special effects and yes bad acting. And when it was bad it was really bad (see “Spock’s Brain”)…but, oh, when they had a good script and a good director then the actors would bring up all the talent they had and everything worked into some of the finest moments of TV history. And “Tribbles” is one of those truly great moments. Near perfect comedic timing from both Shatner and Nimoy in almost every scene in dealing with a situation that is beyond preposterous. Looking for a quick 45 minutes of nonstop laughing The Trouble with Tribbles never fails. I love the Marx Brothers. Mad cap wit and pure insanity. And Groucho as the Prime Minister of a nation is just more insane than you usually get even in a Marx Brothers film. (And there is the sad fact that he’s a better leader than a lot of the world’s current chief executives). I will admit that this has a much weaker plot than some of the other Marx Brother films…but why are you watching Groucho, Harpo, Chico and Zeppo for plot? But the mirror scene, the war scene and a dozen others I find this perhaps the funniest of the Marx Brother movies…but only by a small margin.